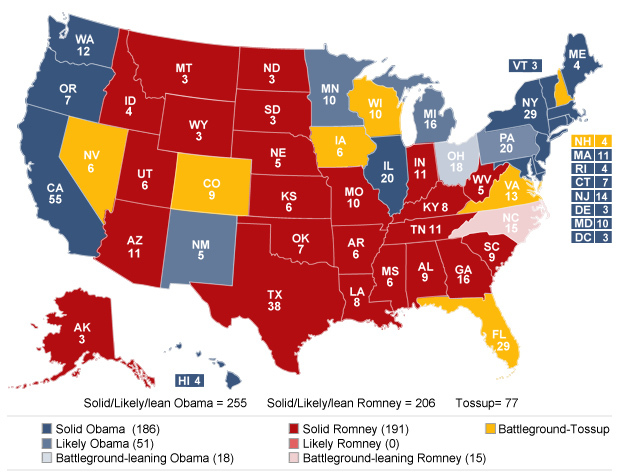 (CBS News) We've seen a steady drumbeat now of polls favorable to President Obama in most of the key battleground states. All of them are snapshots in time -- but the electoral map, as of today, is looking a bit more in favor of the president. Ohio remains a battleground, but now leans blue - toward Mr. Obama. The president has seen a consistent edge not just overall in the state, but internally with the key groups that would swing it. He is up by 10 in our most recent Quinnipiac/CBS News/NYT Times poll, and has large leads in other polls as well. Pennsylvania, meanwhile, now looks likely for Mr. Obama -- he has held a large lead there for a while. A couple of side items worth noting about Ohio: It is clear that Romney has focused on the state and it is part of his preferred path to victory. But he can win the presidency without Ohio, if it were to come to that (and let's remember it is still a battleground). His electoral math at the moment is actually broader than just Ohio. Romney's path really goes through two out of the three, Ohio, Florida, and Virginia. If he wins Florida and Virginia instead, and does well in other battlegrounds, he can certainly still get to 270. And that is assuming the rest of the states stay as they are -- we still have weeks to go and others could always come into play if events change. Moreover, we should remember that while it is true that no Republican has won the White House without Ohio, that's not determinative and is also partly an artifact of history -- not because Ohio is the only barometer of the fortunes of the GOP. For much of the 20th century, the south was solidly Democratic, so a Republican electoral path often depended heavily on Ohio; they couldn't afford to lose it because so many other states were not competitive for them. Nor is Ohio perfectly predictive: Republican Richard Nixon won it in 1960 and still lost to JFK. Polling in other tossup battlegrounds, like Florida and Virginia, has also shown Mr. Obama up by varying degrees - but importantly, there hasn't been quite as much polling in them yet; and much of what we've seen still looks like these states will be heavily influenced by turnout, which remains a big wild card. They remain tossups. We'll of course keep an eye on them in the coming weeks.